“Doctor Who” fans, avert your eyes: David Tennant’s in for it this time. At least that’s what the trailer for “Glorious 39” suggests. A thriller set on the eve of the second World War, the film portrays the impact of the impending conflict on one family dynamic hailing from Britain. If this official trailer’s anything to go by, it’s this year’s high-class answer to “Atonement,” with a similarly credible cast — a mixture of established names and promising hopefuls. Alongside Tennant sit screen icons like Julie Christie (of “Away From Her”), Christopher Lee (of Hammer’s “Dracula” Films), Bill Nighy (of “Shaun of the Dead”) and even Jenny Agutter (of “An American Werewolf in London”), while lesser knowns backing them up have been impressive in their roles so far – Juno Temple having brought a bit of spark to “Atonement” back in ’07. 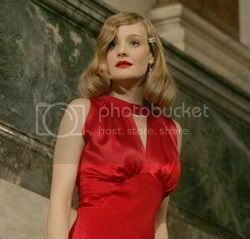 As the lead is Temple’s “Atonement” co-star Romola Garai, whose Anne Keyes character stumbles upon recorded conversations on the pro-appeasement movement that she sets out to investigate. The film marks a return to feature-length filmmaking for writer-director Stephen Poliakoff, who has spent time recently working in television, so you’ve got to wonder how comfortably he’s going to slip back into the format. Going by what the trailer’s given us so far, it’s hard to tell whether “Glorious 39” is going to be stuffy or dignified. The plot involves shady dealings that one girl sets out to investigate, so there’s plenty of shadowy figures always just averting Anne’s glance. As a war movie, the emphasis looks set to be on the unraveling of the mystery plot moreso than the noise of artillery and bombs, but that doesn’t mean the film’s averse to giving us a cool shot of Nighy before a burning flame. I’ve not had a great history with period dramas, but this looks to be tolerable. “Glourious 39” is set for a U.K. release November 20. Information on release dates in other countries is not yet available.